Eating more vegetables is a goal that a growing number of consumers are striving for, regardless of age. In school cafeterias, menuing unique, delicious plant-based options is crucial to ensure vegetarians have something good to eat—but it’s not just vegetarians that are looking for plant-based menu options. Forty-four percent of consumers say they would like more restaurants to offer plant-based protein substitutes for meat, poultry or seafood dishes, according to Technomic’s 2017 Center of the Plate: Seafood & Vegetarian report. And while flexitarian students might not always seek out plant-based proteins, when the dishes offered are craveable and focus less on health and more about taste, participation follows suit. Vegetarian eaters used to be much more uncommon, especially in K-12 schools. These days, though, regular plant-based meals are not only more common than they used to be, but they’re also trending in all foodservice segments. In fact, according to Technomic’s 2017 Center of the Plate: Seafood & Vegetarian report, 59% of consumers eat a plant-based protein at least once a week. Most of those meals, particularly for young diners, though, are eaten at home. But plant-based eating still matters in K-12 program, where 16% of consumers would like to see more plant-based options on the menu, according to IFMA and Datassential, 2017/2018. 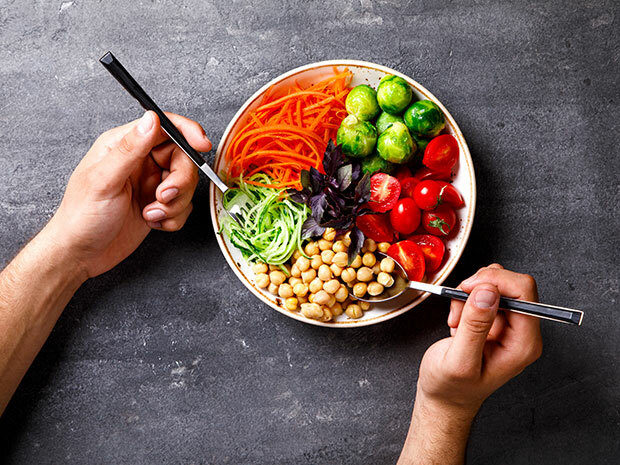 To meet that demand, 42% of school foodservice operators say that they are planning to order more vegetarian items over the next two years, according to Foodservice Director magazine. Ensuring that students eat these options means finding the right plant-based options that taste great. Plant-based food is rapidly changing and expanding to include more—and tastier—options to include crumbles (perfect for tacos) to strips (veggie bacon), formable options and more. Experimenting with flavor and variety. Ethnic flavors, one hot trend in the foodservice world, pair well with plant-based proteins. According to Datassential MenuTrends, Mexican-inspired flavors are particularly popular with current favorites including salsa, guacamole, crema, citrus and jalapenos. Celebrate diversity. Generation Z (those born in 1990 or later) are the most ethnically diverse group to date, according to June 2016 Technomic research. That means there’s an opportunity to celebrate diversity and different cuisines through food. Offer familiar and fresh at once. Generation Z might be more adventurous than other generations of students, but there’s still a limit to what they will accept. Choose one to two bold or innovative ingredients and pair them with more familiar, mainstream flavor profiles. Consider an Asian veggie noodle bowl using sweet chili sauce or veggie street tacos using General Tso’s sauce—it’s a familiar dish with a new flavor twist. Build the plant-based menu. If the standard menu changes regularly, make sure to change the plant-based protein menu, too. Students will be more excited about the veggie-based menu options when they have something new available to try. Add multiple options, too, so kids aren’t always picking the from the same lineup of foods. Menuing plant foods is beneficial for all consumers, but perhaps to younger diners especially. “Consuming a variety of nutritious plant foods provides all of the nutrients children need during an important time of growth,” says David Grotto, senior nutrition manager at Kellogg’s.